The RPG Pundit has replied to my post on ‘What is the Old School Renaissance’ at his own blog here. The whole rant is rather entertaining, and highly recommended for a good chuckle. It seems that the poor Pundit is frustrated by the lack of a clear definition for the OSR. Of course, that was the entire point of my post. It simply is impossible to provide a precise definition for such an amorphous, diffuse, cantankerous group of people. 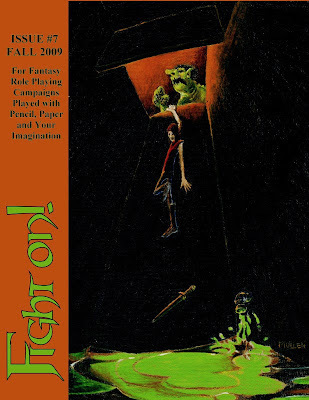 If the OSR is a ‘movement,’ it is one in which the participants disagree with each other about what truly constitutes ‘old school’ (aside, perhaps from a few ‘core cases,’ such as 1974 0e D&D and, perhaps, Holmes Basic D&D; even 1e AD&D is probably considered too ‘new school’ by some participants). 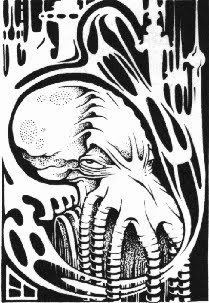 I consider the D&D Rules Cyclopedia and Chaosium’s Call of Cthulhu to be ‘old school.’ Some other folks would not. Amazingly, there is not ‘authority’ in the OSR to tell us who is right and who is wrong. What’s puzzling to me is why the Pundit has such animus towards the OSR. Perhaps he is bitter over the relative lack of success of his own ‘old school’ game, ‘Forward to Adventure!’? Or perhaps he simply likes to construct new ‘enemies’ to be the targets of his rants? Well, Pundit, nobody put you on “the wrong side of the fence” (whatever that means) except yourself. It’s only because you decided to construct an ‘enemy’ out of the OSR, and infuse that ‘enemy’ with a fictional consciousness and ‘ideology,’ that you are on the wrong side of some imagined fence. You could have been a participant in the OSR, Pundit, and you still can, if you like. Heck, I believe that Calithena even invited you to write an article on FtA! for Fight On! a year ago (I know that Jeff Rients positively reviewed FtA! in Fight On!). Destroy that fence that you’ve built in your mind, Pundit. Join the OSR, if you like. Nobody is stopping you except yourself. What is the Old School Renaissance? e. those gamers who contribute to ‘old school’ fanzines like Knockspell, Fight On!, and Footprints, produce ‘old school supplements (like Jeff Rients’s excellent Miscellaneum of Cinder) or who simply put their ‘old school’ ideas up on the internet (typically on blogs) for others to look at and use. 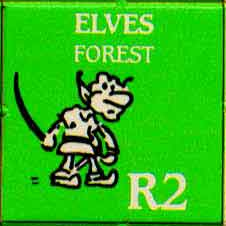 In short, the OSR consists of people who like certain kinds of games (‘old school games’) and sometimes product things (modules, rules books, settings, fanzines, etc.) for those games. There is no ‘ideology’ or ‘party platform’ for the OSR. A fondness for older games and older play styles simply does not comprise an ‘ideology.’ While there is the ‘Old School Primer,’ it is not a ‘manifesto’ in the traditional sense, and I know many members of the OSR who reject parts or all of the advice and views presented in it (myself, I agree with about two-thirds of it). Apparently Mongoose Games is now the biggest company that publishes RPGs exclusively (WotC publishes non-RPGs). My opinion of the company is not terribly positive. Their books, based on my admittedly rather limited exposure to them, often seem poorly constructed, poorly laid out, and poorly edited. There are some exceptions. 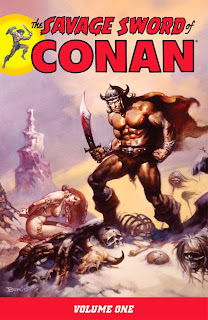 The Conan RPG, at least the ‘Atlantean edition,’ is a decent piece of work (it’s the only Mongoose book that I owned until my recent acquisition of the Elric of Melnibone corebook). Of course, the superior quality of the Atlantean edition was achieved only after Mongoose fixed all of the horrible editing problems with the first printing. Nonetheless, in terms of its presentation and description of the Hyborian world, Mongoose’s Conan RPG is second to none. It is only because I had wearied of the d20 system by the time that I purchased it that I never actually played it. Anyhow, every year the head of Mongoose, Matt Sprange, posts an ‘overview’ of the company’s progress over the previous year and its plans for the upcoming year. The ‘State of Mongoose 2009’ has just been posted here. I’m glad that I waited before checking out MRQ. I hope that MRQII includes an alternative to the ‘hit locations’ system for combat, but I doubt it. Still, I’m interested in checking out the core book. Also, it seems that all of the core MRQII books will be bound in leather. Does this mean that non-leather versions will not be available? The post was not clear on that. With RuneQuest II, we have the opportunity to redress the Eternal Champion series too. The original Elric and Hawkmoon books are great examples of why we have taken a new approach with the whole RuneQuest line. Both were originally 160 page books, but 100-odd pages of each was taken up by the core rules! By taking those core rules out (and adding more pages! ), we can now bring you great volumes packed with Eternal Champion goodness. Elric and Corum will appear first (backed up with some suitably fiendish campaigns – Lawrence Whitaker has already staked his claim for the first Elric campaign! ), but you will be seeing Hawkmoon and the fabled Multiverse sourcebook soon enough. 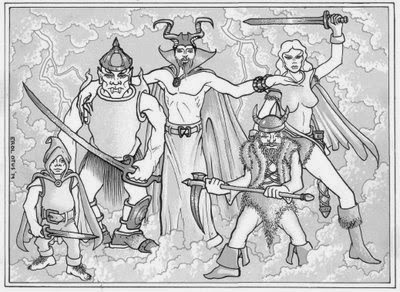 … There are plans to heavily support the Eternal Champion series throughout 2010 and beyond, so if you are a fan of Michael Moorcock’s greatest works and find RuneQuest II to be an agreeable system, you are going to love what we are working on right now. 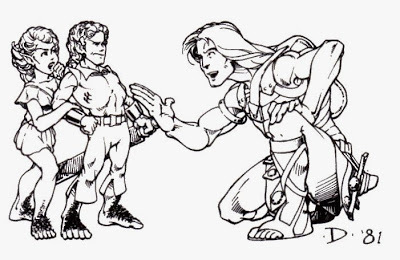 Hopefully the new ‘Eternal Champion’ line of products will still be compatible with the BRP version of Elric!/Stormbringer (5e), the fantasy system with which I’m presently quite enchanted. A disagreement between ourselves and the licence holders has resulted in Conan being suspended in limbo. It is a tricky position – we cannot produce more material for the game (sales of further OGL Conan supplements will simply not justify the work required), and we have been forbidden to move the sword-swinging barbarian to a new games system. This is too bad, as I actually think that Mongoose did a decent job with the Conan, at least in terms of their treatment of the Hyboria setting (which can be used with other RPGs). It would have been very interesting to have seen a RuneQuest version of Conan produced. The system certainly would have been more appropriate than d20, in my opinion (at least a suitably modified version of the OOP edition of RuneQuest with which I am familiar – I assume that MRQII will be similar overall). The last State of the Mongoose also stated that we were revising our editorial and proofreading procedures. Um, yeah. After eight years it’s good that this is finally addressed. Good grief! We also made a promise this year that we would only be printing books in the US – not China, not Thailand, not even Canada, but the good old US of A.
Huh? “…not even Canada”? WTF? What’s wrong with books printed in Canada? 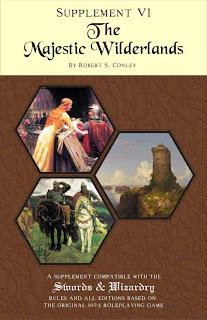 Ruffled patriotic feathers aside, I’ll be interested to see Mr. Whitaker’s version of RuneQuest this year. Another extremely lazy post, I know, but you can never get enough Erol Otus! I can't believe that I forgot to mention at some point during the past couple of months of this blog that internet-friend Benoist of the Citadel of Eight kindly put together a PDF version of my various S&W house rules a few months ago! It can be found here (note that clicking on this opens the PDF directly). Thanks Benoist! This should give people interested a nice 'paper' copy of my house rules something to print up and read when they're on the bus, in the pub (or wherever). 'Feats' in 3e and 4e are an 'exception-based' mechanic. That means that if a PC/NPC/monster (hereinafter simply 'character') has a certain feat, the normal rules do not apply to him/her/it. Instead, other rules apply to the character. Feats provide 'exceptions' to otherwise universally-applied rules. My dislike of feats has nothing to do with 'fairness.' 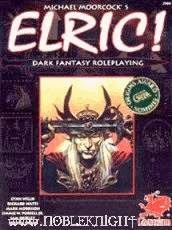 Indeed, such a concern would be laughably misplaced, given how concerned the designers of 3e and 4e were to ensure overall 'balance' within their systems (i.e., all character classes, races, and so forth, are equally 'powerful' and 'useful' -- sadly defined exclusively in terms of combat ability in 4e). (b) here are hundreds of fiddly exceptions to those rules (often with their own 'sub-rules'). Blech! In contrast, a system like 'Basic Role-Playing,' which uses skills, is not 'exception-based'. The same rules apply, all the time, without exception. Some characters will be much more skilled at certain things than others, and thus enjoy much greater success rates at those things than others. However, there is no need to provide 'rules-exceptions' for those characters. The overall mechanical structure is far more parsimonious, and intuitive in my opinion, than the feat-based mechanical structure of 3e and 4e. To some extent, the same thing is true of older versions of D&D. Higher-level characters will have a greater chance to hit, make their saving rolls, etc., than lower level characters, but the basic mechanic is the same for all characters. 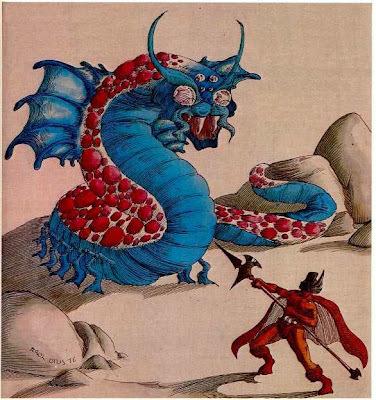 (I'll concede that there are some 'exception-based' rules in older D&D -- namely, class-based abilities -- but they are far, far fewer in number than 'feats' in 3e and 4e. Consequently, they do not really bother me.) So that's it, gentle readers. That's why I hate feats. Phew! It felt good to get that off my chest. More fun 'old school' art from the artist "Steve," who goes by the moniker "Ye Olde School," here. I just finished reading volume one of The Savage Sword of Conan. These volumes, published by Dark Horse Comics, reproduce the Savage Sword of Conan comics from the 1970s (originally published by Marvel). Volume 1 was excellent, and I've already finished the first story of volume 2. My only complaint with volume 1 is that it presents only the second half of the classic Howard tale, "The Hour of the Dragon." I don't know why the entire story wasn't published in Savage Sword, although I suspect that the story was perceived as simply too long to be presented in this format. Anyhow, that minor complaint aside, I highly recommend these books to anyone who is a fan of Conan (or 'swords & sorcery' tales more generally). I look forward to many months of further reading! I've long admired Chaosium's "Basic Roleplaying" system. During my most active role-playing years as a teen, such games as Call of Cthulhu, Hawkmoon, and Runequest (2nd edition) were among the games that were part of our regular rotation (although, I have to confess, they saw far less 'game time' than AD&D and, later, MERP and Rolemaster). I especially enjoyed playing a 'D&D-ized' version of Runequest, which involved the core book and some optional rules from the magazine White Dwarf (from back in the days when WD published articles on a variety of different RPGs, before it became a catalogue for Warhammer minis). While I haven't played BRP in many years, I've always admired its intuitive yet nuanced mechanics. A revised and expanded version of BRP was published recently, and I had been meaning to pick it up for many months now. Since Chaosium is having a sale until November 1, I finally have been prompted to make this long-neglected purchase. 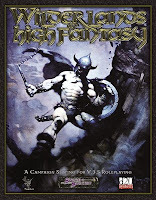 Further prompting me, is the release of a 'D&D-ized' version of the BRP rules called 'Classic Fantasy,' which brings to mind the White Dwarf-RQII variant that I enjoyed greatly so many years ago. "The Society for Optimalised Objectivism, a conspiracy overseeing the Market of Uugen, is dedicated to upholding absolutely free market forces within their sphere of influence. They worship an ancient star vampire residing in a crystal globe; the “high priestess”, An-Raydn, enjoys good relations with the Supreme High Bursator of Fedafuce, the venerable Grenspanios (now living in a distant city state)." ~ Gabor Lux, "The City of Vultures," Knockspell #3, p. 34. October 27, 2009 – Mythmere Games, developer and publisher of the ENnie-award winning Swords & Wizardry fantasy role-playing game, is pleased to announce an exclusive agreement with Black Blade Publishing to publish the Swords & Wizardry Core Rules and Knockspell magazine, and to lead the charge to get Swords & Wizardry into retail distribution. The first print releases under this agreement will be a softcover version of the 124-page Swords & Wizardry Core Rulebook and Knockspell #3. Working with Studio 2 Publishing as its distribution partner, Black Blade Publishing expects the Swords & Wizardry Core Rulebook to start hitting the shelves of brick and mortar game stores by February of 2010. In addition, the in-print version of the Swords & Wizardry Core Rulebook will be available for purchase directly from Black Blade Publishing or through select retailers by late-October, 2009. Electronic copies of the Swords & Wizardry Core Rulebook will be available immediately directly from Black Blade Publishing, and will be available very soon directly from Studio 2 Publishing, DrivethruRPG, RPGNow and YourGamesNow. Print versions of Knockspell #3 are available for purchase directly from Black Blade Publishing, and issue #4 may be distributed to stores around February of 2010, at the same time as the core rules. Founded in 2008 by Matthew J. Finch, Mythmere Games is best known for the Swords & Wizardry fantasy role-playing game, the award-winning retro-clone of the original 1974 edition of the world’s most popular fantasy game. For additional information, visit http://www.swordsandwizardry.com. 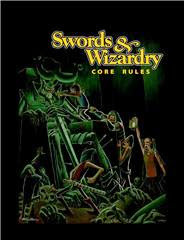 Formed in 2009 by Jon Hershberger and Allan Grohe, Black Blade Publishing will begin publishing the Swords & Wizardry Core Rulebook in October 2009 under license from Mythmere Games. For additional information, visit http://www.black-blade-publishing.com. Studio 2 Publishing has been serving the games hobby industry since 2004, serving game designers and publishers as a sales and marketing organization as well as providing fulfillment and inventory management services. For additional information, visit http://www.studio2publishing.com." It sounds like a great arrangement, and I look forward to the future success of S&W and Knockspell! Say, speaking of Knockspell, issue 3 is now available. I'll have a few comments on it tomorrow (time permitting). More seriously, I just wanted to mention that I'm still around, but my current teaching responsibilities have prevented me from thinking about, much less blogging about, RPGs over the past couple of weeks. Hopefully things will lighten up somewhat in the near future. For the sake of convenience, here are links to my various posts on my campaign setting ‘Ilmahal.’ Like my ‘house rules’ index, I will update this index as I post more information on Ilmahal. The Duchy encompasses a medium sized island (roughly 80 miles north to south, and 40 miles east to west), off the eastern coast of the Island of Ilmahal. The northern third of the island is dominated by a grim and menacing woodland called the Maelvorn Forest. Beyond the forest, on the northeastern corner of the island, are the wild highlands called the Storm Ridges. The southern part of the island consists of fertile farmlands and river valleys, although sparsely settled rocky hills dominate the eastern and western coastlands. The island – called ‘Brohn’ in the ancient Morghain tongue – was inhabited by a peaceful, if primitive, Morghain clan for many centuries. It eventually was conquered by Aphorian legions some twelve centuries ago. The island was abandoned by most human folk approximately four centuries ago, when the Aphorian Imperium withdrew its legions from Ilmahal. Much of the island was overrun subsequently by disorganized bands of humanoid savages. These bands settled in the abandoned Aphorian villages and forts that dotted the island, and fought amongst each other in a disorganized fashion for many years. Approximately 225 years ago, a troop of mercenaries and adventurers led by the renowned warrior Flavius Briz landed in the ruined southern port of Irylond. 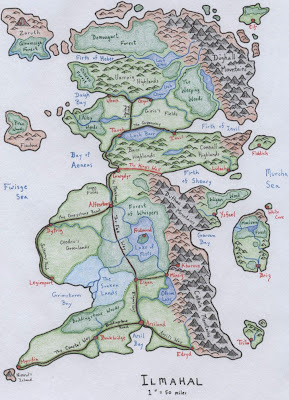 Briz and his followers subsequently re-conquered the southern part of the island, slaying thousands of humanoids and driving the remainder into the dark Maelvorn Forest to the north, or the Storm Bridges beyond. Flavius Briz then declared himself duke of the island, renamed the port Irylond after himself (now simply ‘Briz’), encouraged the resettlement of the farmlands, and established three guard towers to protect the southern island against future humanoid incursions. Over the subsequent decades, a number of freemen from southern Ilmahal, tempted by the prospect of establishing their own farms and businesses, settled in the duchy, contributing to its wealth and stability. Most of the duchy’s human population live in the southern part of the island. The one exception is the fishing town of White Cove, which is considered part of the Duchy. The present Duke of Briz is Duke Aelig Briz II. A small number of furtive Waldleuti (diminutive forest folk) dwell in the southern Highland Forest. 1. Briz. (Formerly called ‘Irylond.’) The capital and only sizable town in the duchy, Briz is a moderately cosmopolitan cultural and economic centre, and hence the only place where representatives of other lands, and even other races, have permanent trading bases. The imposing tower of Duke Aelig Briz II can be found on a small island attached to the town by a grey stone bridge. The ‘Red Raven Inn’ is large and rowdy establishment, frequented by rogues, mercenaries, adventurers, and other dubious sorts. The ‘Black Sail Tavern’ is rumoured to be the headquarters of the local thieves’ guild; they are said to led by the beautiful Amarrah Evensong, and run a brisk smuggling operation. An order of scholars, ‘The Grey Order,’ has a college in the town. In addition to educating the sons of the petty aristocrats of the Duchy, the Grey Order has been known to hire adventurers to obtain rare items (lost relics, strange herbs, and so forth) for their esoteric researches. Some of the ruins of the ancient Aphorian town ‘Irylond’ are said to persist partially intact, hidden beneath the bustling port, allegedly holding lost treasures, forgotten lore, and dark eldritch horrors. 2. Solan. A fishing village on the southwestern coast of the island. A number of ancient Morghain cairns can be found to the southeast of the village, many of which are rumoured to be haunted by restless spirits. Treasure hunters sometimes venture into the cairns. They rarely return, and those that do generally wish to say nothing of their experiences in the hidden mounds of the dead. 3. Riagad. A fishing village on the eastern coast. A couple of small copper mines in the nearby hills provide additional revenue for the town. Riagad has a reputation for being dull. 4. Ninian. Another fishing village on the eastern coast. Sometimes called ‘Old Foggy’ because of the cool mists that perpetually form off the coastal hills. The village is ruled by a mayor, Sir Bran ‘the Melancholy,’ who is an ex-adventurer. An important lighthouse lies a few miles to the northeast of the village. A strange blue fire burns from the lighthouse’s brazier at all times. Only the lighthouse’s keeper, the taciturn Carthedon, knows the secret of the blue flame. The village’s only inn, ‘The Drunken Herring,’ is known throughout the realm as a welcoming and lively place. 5. Juvad. A trading village surrounded by a number of grain farms. The ale and lager served by ‘The Golden Grain’ – owned and run by garrulous Liam ‘Gutboy’ Brewson – are famous throughout the duchy. A reclusive mage named Neveldar ‘the Blue’ lives in a mansion just outside of the town. His diminutive servant Roderick obtains supplies and news for his master, as the mage never leaves his manor. A faint blue mist emanates from the bricks of Neveldar’s manor at all times. Strangely, as far as the villagers can tell, the mage has not aged a day since constructing and entering his manor some forty years ago! 6. Envel. A prosaic rural backwater, Envel is surrounded by farmland. In addition to grain, some farmers near Envel grow an unusual crop – pumpkins. The pumpkin ale sold by the tavern ‘The Goblin’s Nose’ is famous not only throughout Briz, but in lands further away. The owner of The Goblin’s Nose, Zethar ‘Orange-thumb,’ is a wealthy man, thanks to the money he has made by exporting his ale. 7. Maugan. A small town located in the coastal highlands. It supports a few nearby silver mines. Some of the abandoned mines are said to be haunted. 8. Pereg. A highland town surrounded by farms to the east, and a large temple devoted to Amithos (the sun god) and the Solar Court to the west. Many religious subjects of the duchy make pilgrimages to the temple. It is well known for its potent whiskey (‘Pereg’s tears’), which is somewhat popular with the temple’s clergy. 9. White Cove. The second largest town in the Duchy, White Cove dominates a small rocky island to the north of the dreaded Storm Ridges. The tower of the powerful wizard Ulfor – a friend of the Dukes of Briz – overlooks the town. Ulfor is the formal ruler of the island, holding the title of ‘baron,’ although he typically delegates responsibility for day-to-day affairs to White Cove’s mayor, Sir Aidan. Ulfor has dwelt in his tower for over a century, and is widely believed to be the most powerful wizard not only in the Duchy of Briz, but in the surrounding areas as well. Rumours claim that he is either half-fey or half-demon. Ulfor has been known to pay adventurers great amounts of money for the retrieval of rare substances and items (lost artifacts, exotic herbs, rare gems, parts of magical beasts, and the like). 10. Three imposing guard towers stand at the southern border of the Maelvorn Forest to limit humanoid incursions into the civilized lands of the south. Gentle Ridges. A small range of rolling coastal hills that contain a few copper mines, most now abandoned. Some ancient Morghain ruins can be found in hidden vales throughout the Ridges. Highland Forest. A small forest made up of a mix of deciduous and coniferous trees. A number of small Waldleuti settlements are scattered throughout the forest. The Waldleuti avoid contact with most outsiders. Some ancient haunted Morghain barrows are said to exist in the wooded hills. Maelvorn Forest. A dark and gloomy forest, the Maelvorn dominates the northern part of the island. Many tribes of humanoids live scattered throughout the woods, fighting amongst each other, and occasionally raiding south into the rich farmlands of the Duchy. More dangerous and powerful creatures are rumoured to dwell deeper within the forest, including a sleepy but powerful emerald drake. Legend suggests that some ancient and beautiful – but deadly – non-human (perhaps even pre-human) ruins can be found near the murky Lake Vorn in the centre of the forest. Misty Hills. As their name suggests, these hills typically are covered in mist formed by moisture blown in from the Murcha Sea. Some ogres are known to dwell within the caves that dot the hills. They occasionally raid nearby settlements. Sir Bran, mayor of Ninian, has offered a bounty of one hundred gold coins for the scalp of every ogre brought to him. Off the coast of the Misty Hills lie five forested islands. As far as anyone knows, they are uninhabited by intelligent creatures, although it is believed that the ruins of an ancient Aphorian order of sages – the ‘Amber Savants’ – can be found somewhere on one of the islands. Western Highlands. An imposing range of rocky hills that dominates the western coast of the island. A number of ancient Morghain cairns can be found throughout the highlands. The cairns are said to be filled with treasure, but haunted by terrible, restless spirits. Local tales speak of an ancient Aphorian monastery somewhere within the northern hills, concealed by mystical means. Storm Ridges. An unpleasant, broken land, with little vegetation, the Storm Ridges primarily consist of reddish and black rocky hills. Sailors and fishermen regularly report seeing a mysterious, ancient purple tower on one of the highest hills on the northern part of the ridges, near the Maelvorn Forest. No one who has investigated the tower has ever returned. Swamp of Norg. A fetid marsh covered in a perpetual miasma of malevolence. According to legend, the swamp was created many centuries ago following a great battle between a demon frog lord named Norg and a great Morghain hero named Cadifor Manus. A tribe of lizard men and a band of depraved frog people are said to dwell in the swamp. Sailors have reported seeing mysterious barges leaving the swamp in recent years. This is a revised and expanded version of my description of the Duchy of Briz (the original description can be found here). 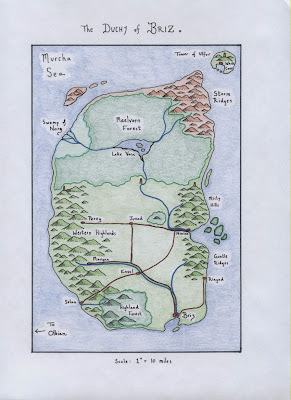 In addition to providing more details on the various towns, regions, and NPCs of the Duchy, this version gives much more information on the kinds of possible adventures that can take place in the Duchy's different areas. I've submitted this version of the Duchy of Briz to Fight On! magazine (along with some notes on adapting the Duchy to one's own campaign world, which I've left out of this post). Further edits may be necessary, of course, but hopefully nothing of substance will be changed. This is the version of the Duchy of Briz that I used for my summer Swords & Wizardry campaign. I plan to post a summary of that campaign at some point in the near future.